A behind-the-scenes look at how Floyd Scholz creates one of his most ambitious pieces--a life-size golden eagle in flight. Beautiful color photos document the carving's progression from a block of wood to a finished work of art. Accompanying text offers how-to information as well as Scholz's thoughts as he works on the carving. Includes preliminary sketches and notes, candid studio shots, work-in-progress images, corrections, and journal entries. 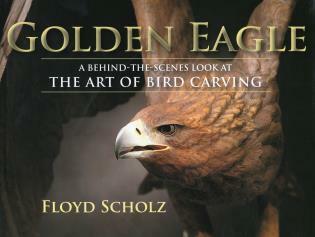 A unique look at the creative process that will inspire carvers, artists, and bird-lovers alike.